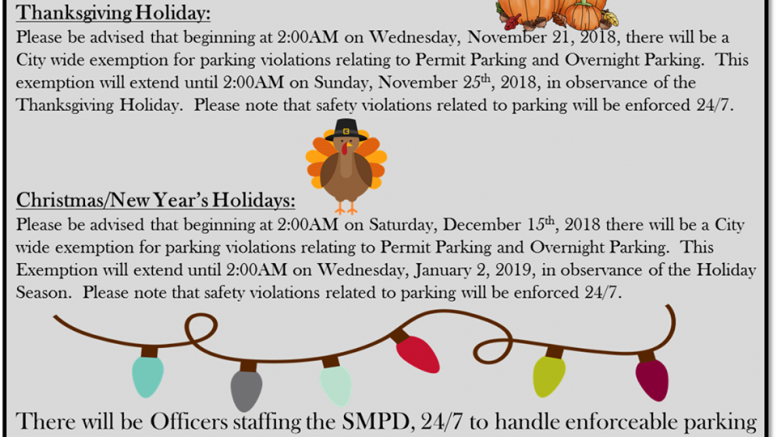 Posted 11/16/18 – Beginning at 9am on Wednesday, 11/21/18 and continuing through 2am on Sunday 11/25/18, there will be a citywide exemption for parking violations relating to permit parking and overnight parking in observance of the Thanksgiving Holiday. Likewise, in observance of the Christmas and New Year’s holidays, there will be a similar citywide exemption from 2am on Saturday, 12/15 through 2am on Wednesday, 1/2/19. Please note that officers will enforce safety violations and enforceable parking issue during those times. Safety violation include but are not limited to red zones, white zones, blue zones, parking violations obstructing ingress/egress to the roadway or sidewalks.